Spring is the perfect time of year to break away from everyday life for a journey to a new destination. Get started planning your spring break trip with these ideas. Museums are a great place to learn more about your favorite topics, see memorabilia and share your passion with your traveling companions. Look for a destination with museums dedicated to a wide range of interests, like the broadcast industry or the path toward freedom in America, for example. One of the best ways to appreciate the local flora and fauna is inserting yourself right into the middle of it. 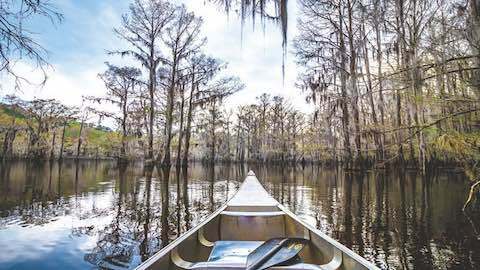 For example, at Caddo Lake State Park in Karnack, Texas, you can paddle waterways dotted with bald cypress trees draped in Span­ish moss that tower over the lake’s maze of bayous, sloughs and ponds. While visiting the park you can also stay in a historic cabin, try your luck fishing, hike, picnic, camp and even experience an adventure within an adventure when you look for a geocache. Zoos across the country may have one thing in common (the animals, of course), but each offers its own special touches that make learning about and interacting with animals a fresh experience. From petting areas to drive-through safaris that put you right in the middle of the animal kingdom, there are plenty of ways to satisfy the animal lover among your group. If there’s a history buff in your travel party, a destination like the Texas State Railroad takes visitors back in time by allowing them to ride a refurbished train car through a round-trip, four-hour, 25-mile rail journey through the Piney Woods of East Texas. Vintage steam and diesel locomotives take passengers on a trip featuring historic narration, comfortable seating and food and adult beverage services. Vacations & Travel "Break Away for a Spring Travel Adventure"